Hey all, Danny here with your weekly insight into formations. 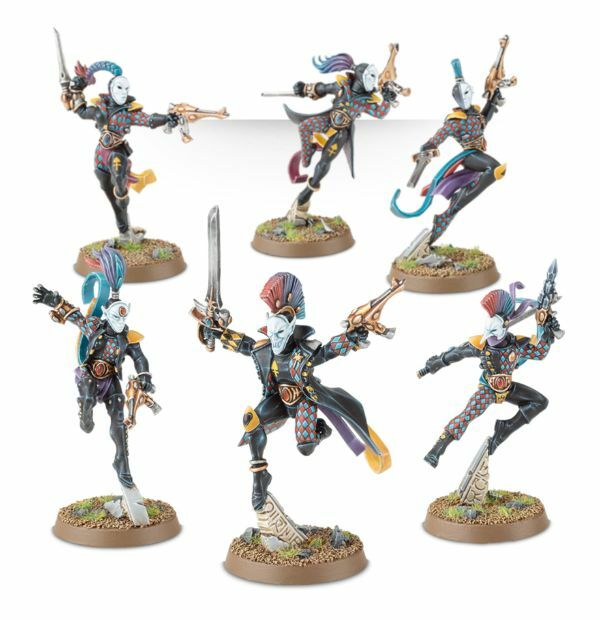 This week, let’s take a look at one of the more maligned codexes out there with some Dark Eldar fun! Scout: You get to outflank or make a Scout move at the start of the game. Freakish Spectacle: While not normally permitted, these 5 Talos form one single unit. Let the Harvest Begin: Each time this unit destroys a non-vehicle unit in close combat, you score an additional Victory Point. In Kill Points, this still generates an additional VP, so yes, you would earn 2 points. So, what you get here is a mini-death star of 5 Monstrous Creatures that are scary good in close combat with some respectable shooting as well, all in a Toughness 7 chassis. Wow, 5 MCs in one unit? Yep, that really is the meat of this formation. 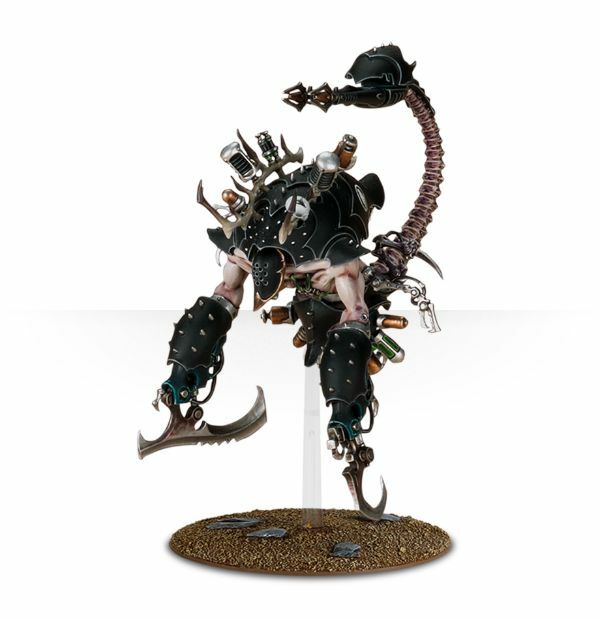 You get an otherwise impossible to assemble unit that has 15 wounds spread out over 5 models, all with T7 and a 3+ save and Feel No Pain. This means they are immune to S3 attacks and even the ever-ubiquitous S6 needs 5s to wound. 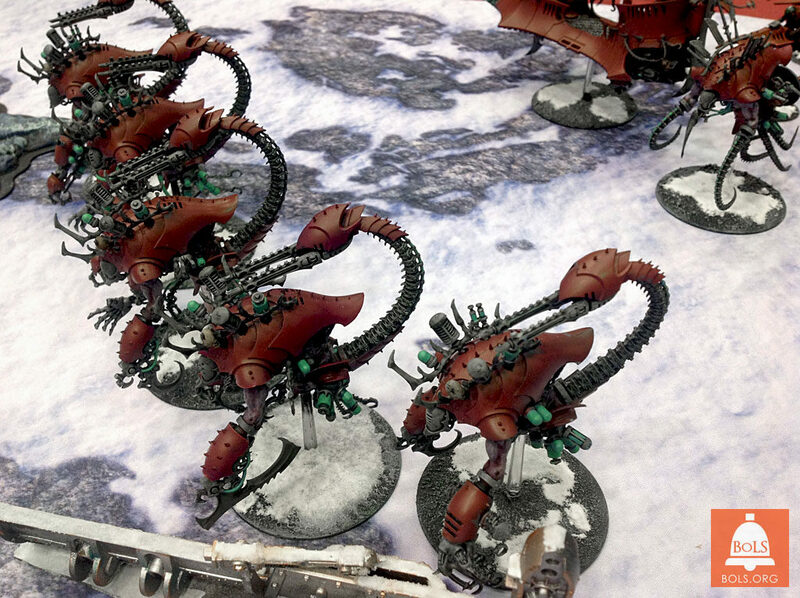 It takes about 4 scatbikes on average to do a single wound to these bad dudes. In combat, these guys each pump out 5 WS5 S7 AP2 attacks at I4 on the charge, making them more than capable of eating anything shy of a dedicated close combat unit. 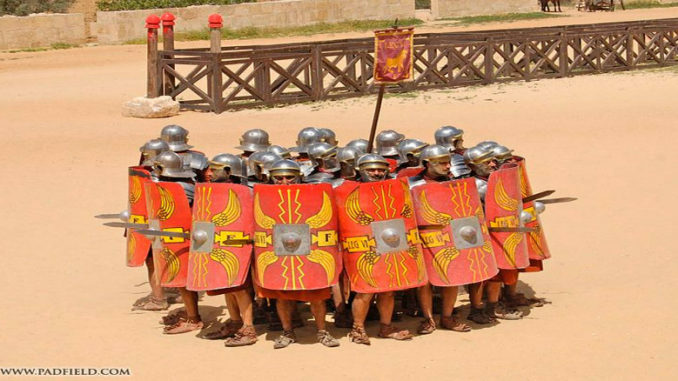 If the enemy unit doesn’t have a whole lot of 3++ saves or a large mass of bodies, it will get wrecked pretty quickly as most infantry weapons capable of hurting them with likely die before they can swing. 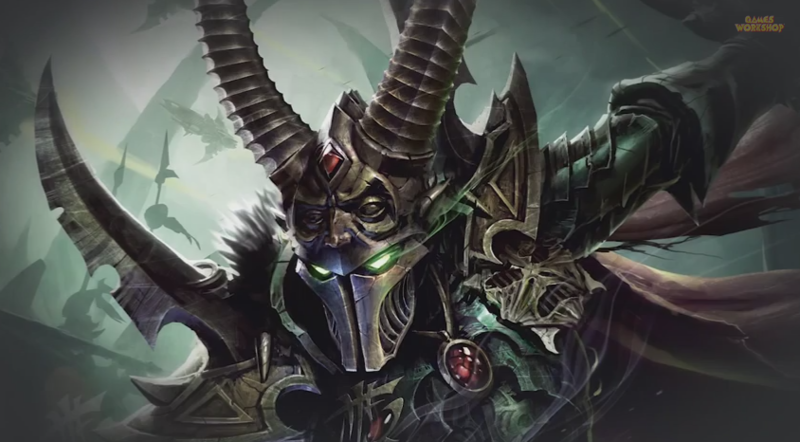 This lets them eat almost any infantry unit with little fear. Obviously, with Let the Harvest Begin, being able to wrack up VPs really helps to win the mission. 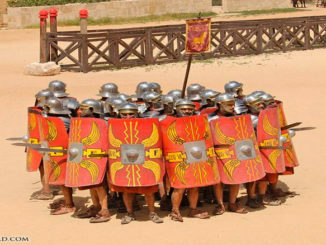 This formation can absolutely screw over Battle Company or any other MSU build as their advantage in the maelstrom is suddenly removed. You want these guys in combat and eating units as fast as possible, and the more they eat, the more you win. This is not a cheap formation, but if they earn you 2 or 3 extra VPs, that may just have given you a win. This unit also pumps out some pretty amazing shooting standard with 30 S1, AP5 Poisoned 4+ shots. This volume of fire can absolutely shred most infantry units or even other MCs. For a bit more points, you can also upgrade their shooting to either haywire (for absolute vehicle destruction) or Heat Lances for a mix of anti-tank and anti-terminator. Honestly, haywire is likely the best build in the meta right now as these guys are scared of Knights, but with the haywire guns, they aren’t anymore. This also lets them pop transports and then feast on the juicy goodness inside. You an actually ally with them! This formation can get spendy, but at 600 points base, it slots in really well with Eldar. 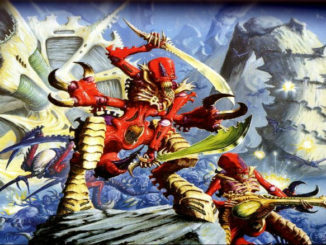 While Dark Eldar are pretty crappy as a standalone or even primary detachment, this formation really gives you some great melee and shooting in a convenient package. If you can fortune them, get invisibility or even shrouded on to them, they are going to be extremely difficult to shift. The real trick to this unit is Scout. These guys are tough but not invulnerable, and they are slow, so having them Outflank really lets them get into the back field and cause problems. Travis has the best tactic for them: use them to eat the backfield of your opponent’s army where chances are, they lack the ability to really deal with the unit. Not only could they take a backfield objective from your enemy, they could also earn you a VP or 2 in the process, pretty much tipping the mission in your favor. You probably don’t want them to actually deploy and make a Scout move as they are still slow, and again, they aren’t invulnerable. Ok, so how do I kill these monsters? Well, as is unfortunately far too common, D and Grav solve this problem easily. 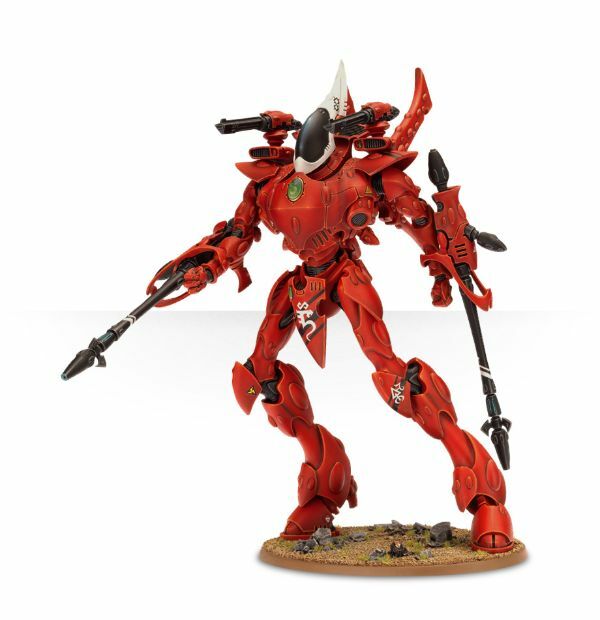 Ranged D (like Eldar/Tau) will easily whittle this unit down as no armor saves or no FNP is bad. Real bad. Obviously, grav devastators or centurions will gobble this unit up with needing 3s to wound with a likely reroll and they only get FNP. If you can get your opponent to commit this unit too early before you drop in with the big punch, you can just pick them up without much issue. 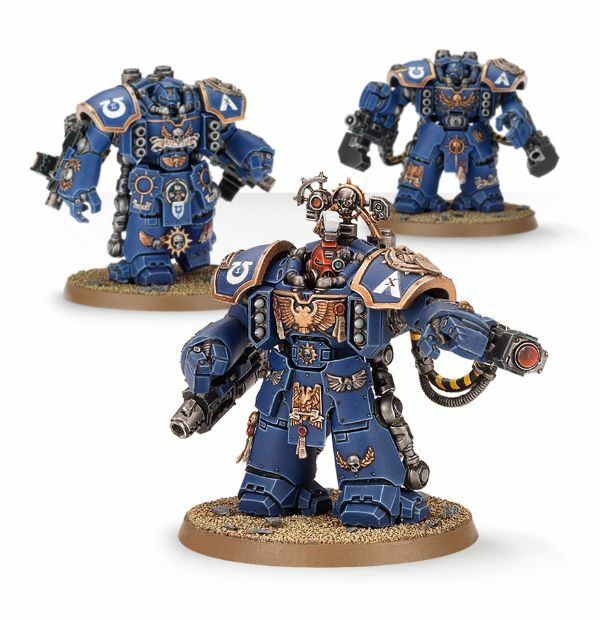 While these guys are mean in melee, dedicated melee units like Cabal-Stars (with force weapons), all the various Imperial stars, or Wulfen/Purestrain Genestealers/Large GSC Acolyte squad will also rip this unit apart. 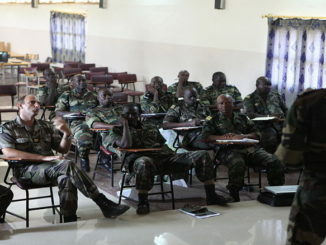 Either massed S8 or above, Force weapons, or massed rending will take them out without much issue. These Talos are like a deathstar, but they really can’t compete with the other deathstars out there, and there are also plenty of melee units that can go toe-to-toe. This unit (especially without the Haywire guns) is terrified of Knights or Gargantuan Monstrous Creatures. While Stomp doesn’t hurt them much, the roll of a 6 will kill 2 or even 3, and that is most of the unit right there. If someone has a D melee weapon, they are just dead. These dudes are also slow. They can’t run and charge, and they only move 6 inches, so a lot of units can simply outrun them. Especially if they are deployed on the table (which you shouldn’t do), you can just go around them most of the time, so their awesomeness really only works against a static unit. These guys are powerhouses, but they have to applied correctly, and a poor decision or even a bad Outflank roll might mean that these Talos do nothing for the entire game. So in the end, we have a unit that really compliments some whackier builds, and they are cool models, but this is a very powerful unit when applied correctly; unfortunately, it is easy to misplay them or simply to run into a hard counter. Anyway, you should totally think about TFG Radio’s Patreon to help us fuel our flesh-crafting experiments. We live in LA after all.